Designed from high quality, heat treated AISI 1045 stamped steel. Zinc plating delivers greater corrosion resistance than paint. Inside and outside welds deliver superior strength. 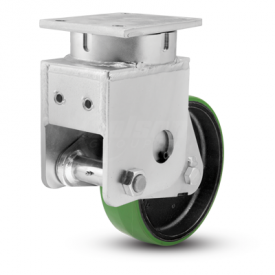 This spring-loaded version of our 310 Contender Kingpinless casters offers great load capacity and shock protection. Noise levels are reduced through the dampening effect of these casters. Capacities listed at 50% of wheel deflection (21/32″). The total possible wheel deflection is 1-5/16″.